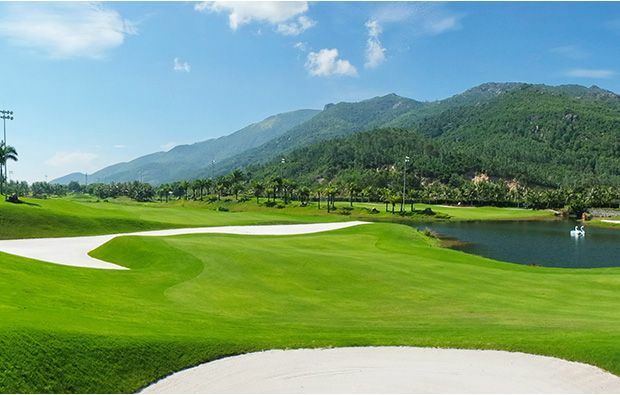 Diamond Bay Resort & Golf is one of the more interesting golf courses in Vietnam and has been cleverly designed to integrate with the natural terrain and makes best use of the natural water habitats, sand dunes and the native trees. As you traverse the course you get great views over the ocean and the mountains in the background. Plenty of water on the course and your drive from the first tee requires a shot over a water hazard to a fairway guarded by a huge bunker. 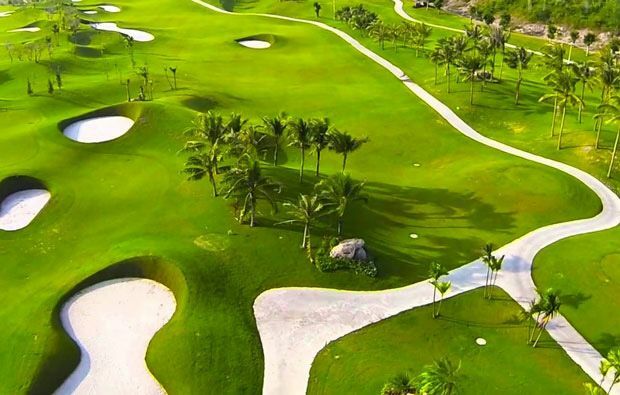 The second is an uphill par 5 often played against the prevailing wind with an undulating and difficult green. This is followed by another par 5 with great views over the sea but the hole turns sharply as you approach the green which is protected both sides by bunkers. The 4th is a pretty straightforward par 3 but the wind can make club selection difficult. The 6th is one of the most beautiful holes on the course with amazing views of the surrounding mountains from the elevated tee boxes – the green is surrounded on one side by water and the other by larger bunkers. The 7th is a very difficult par 4 which requires a long approach over water to a long narrow green. The 8th is a memorable par 4 with a large landing area but the wind is usually in your face so you will need more club to reach the green. The 9th is another very difficult par 4 which higher handicappers are advised to play as a par 5 because the approach to the green has to carry the fairway river bunker to a green with water along the left. 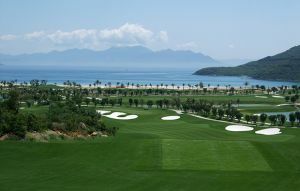 As you start the back nine at Diamond Bay Resort & Golf in Nha Trang you are faced with an intimidating drive with water in front of the tee boxes and along the left side of the fairway and this is followed by a challenging approach to a green with water wrapping around the right side and a bunker left. 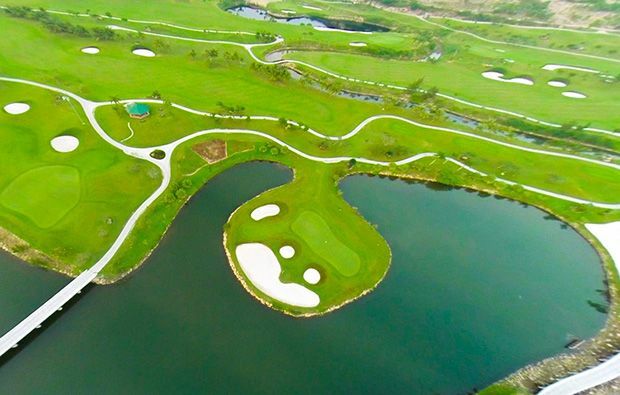 The 11th is a very exciting and difficult par 5 and you play from the island tee boxes over water and sand to a narrow fairway and the green is surrounded by the beach and water on one side and more bunkers on the other. The 12th is the signature par 3 with a carry over water to an island green with pot bunkers just in front of the green. The 4th is a downhill par 4 which usually plays downwind and offers a rare birdie chance. The 14th is a another tough par 4 played into the wind with water both sides and difficult green. The 15th is not too bad but water again features both sides of the fairway. Diamond Bay Resort Golf Course has different Services to offer. Choose a date and number or players to see the rates.